Rajasthan player (in maroon) drives in against Telangana (in white). Puducherry, 5th February 2016: The last day of the league stages at the Arise Steel 42nd Sub-Junior National Basketball Championship began with crucial knockout matches in the early morning session. The top-placed teams of the level 2 groups took on each other for a spot in the pre-quarterfinal. Kerala boys squared off against neighbours Tamil Nadu in the opening game. Kerala started the game well and outscored their opponent massively in the second quarter (25-3). In the second half, Kerala held on to their lead, despite Tamil Nadu’s attempted comeback, and clinched a 78-54 victory to advance to level 1. In the other boys’ qualifying game, Karnataka boys edged past the Delhi side by a slim 3-point margin. Led by Akshan Rao’s 22 points, Karnataka registered a 64-61 victory. Delhi’s Himanshu scored 28 points in a losing effort. The Telangana and Rajasthan girls teams also moved ahead to level 1, defeating Odisha and Himachal Pradesh respectively in comfortable fashion. In the level 1 girls’ games, Maharashtra were led by their best scorer Shruti Bhosale’s 17 points to defeat Uttar Pradesh 60 to 41. Madhya Pradesh girls got the better of the Delhi team in their level 1 game defeating them 52-30. The boys’ level 1 games, Andhra Pradesh boys set a new tournament team scoring record in the tournament putting up 105 points against Chandigarh. Md. Ghouse Mohiddin’s 34 points and Sai Pawan Kumar’s 30 points carried the AP team to the century mark. The Rajasthan boys beat Uttar Pradesh in a close game that ended 65-60 in favour of Rajasthan. The loser knockout tournament also commenced in the second half of the day featuring teams that have been knocked out of contention in the tournament. 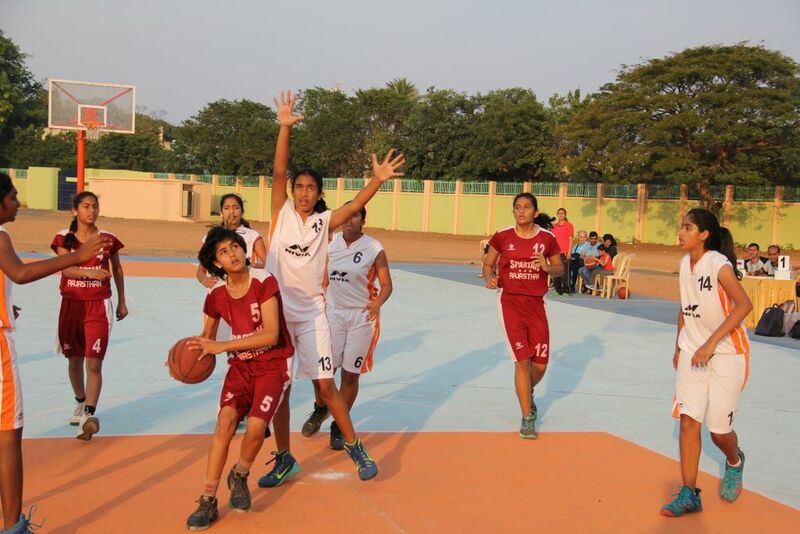 Andhra Pradesh, Punjab, Chandigarh and Gujarat girls advanced to the semifinal stage of the loser knockout along with the West Bengal, Telangana, Bihar and Punjab boys. The level 2 teams that have advanced to the pre-quarterfinals faced each other in the evening on the outdoor court to determine their opponent in the pre-quarters. Kerala boys beat Karnataka and they have chosen to face Maharashtra in the pre-quarterfinal, while Karnataka boys will face Andhra Pradesh. In the girls’ games, Rajasthan beat Telangana and they will battle it out with Uttar Pradesh girls for a spot in the quarterfinal. Telangana will face the Haryana girls in their pre-quarterfinal match. Haryana girls lost their level 1 game to Karnataka today evening, giving the Karnataka girls a direct entry into the quarterfinal.